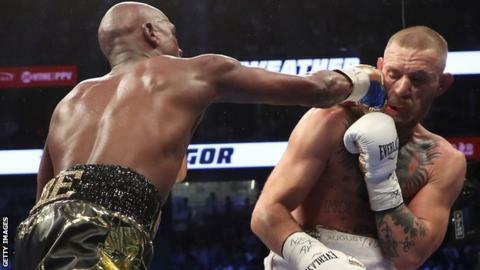 Floyd Mayweather Jr. picked up the 50th win of his illustrious career, defeating Conor McGregor by 10th-round TKO on Saturday night in Las Vegas' T-Mobile Arena. With the victory, Mayweather surpasses Rocky Marciano, who retired in 1956 with a 49-0 record. After the bout reached the halfway point, McGregor began looking visibly fatigued and Mayweather sensed an opening. He showed a level of aggression rarely seen in his previous 49 victories. According to SHO Stats, Mayweather had landed 132 punches compared to 80 for McGregor entering the 10th round.